Fitchburg State University students, faculty & staff FREE! All ages & skill levels welcome: USCF rated games, casual games from 6:00 to 7:00 & all night in the skittles room. Learn the more common USCF rules & avoid conflict. Observe any announcements of rule changes or special rules prior to beginning play. Verify that the clock is properly set, especially if it is not your own clock. Stop/pause the clocks & summon the Tournament Director in order to make a claim. Maintain calm demeanor & express yourself clearly. It is not my intent here to list every rule in the USCF Rule Book, but rather, in the interest of education, to provide reference points for some of the rules & procedures that give rise to the most common questions & controversies. The vast majority of chess games are played as friendly encounters in the spirit of good sportsmanship. It should not be necessary for anyone, in particular new or inexperienced players, to learn a multitude of exact fine details of rules &/or exceptions to those rules in order to participate comfortably & effectively in such competition. However, since a large percentage of the disagreemnets that do occasionally occur are a direct result of one or both players' not knowing the actual rule in question, but rather having a "belief" in what the rule "should" be, it is good practice to develop an understanding of what the rules actually are. I have selected these excerpts to provide some insight into the general overall flavor of the latest USCF Rules & because they address specific situations questions or disputes that have recently arisen in my own limited experience at local tournaments & clubs. 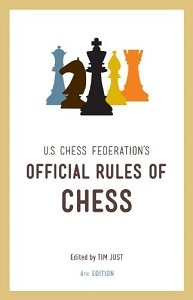 For more extensive explanations & complete coverage of all USCF Rules, please consult your tournament director or purchase a copy of the USCF Rule Book linked in the picture above. Special thanks to Arthur Barlas, who graciously lent me his copy of the "USCF's Official Rules Of Chess" to use as a reference for this page. click here for a .PDF file of the Crenshaw-Berger Tables. "In areas in which the director has discretion, it is appropriate to be strictest with rules enforcement & penalties in events that are stronger or offer larer prizes. Being harshly penalized over a trivial rules violation can be sufficiently upsetting to deter a beginner from future chess participation." "Except where specifically noted in the rules, the standard penalty assessed by the director is to add two unused minutes to the remaining time of the opponent of the player not following the rules of chess." "Except where specifically noted in the rules, the director may assess penalties either more or less severe than the standard penalty (1C2a). It is often more appropriale for a director to issue a warning(s) before applying 1C2a in cases involving young or inexperienced players. A director may assess a more severe penalty in cases involving players who repeatedly do not follow the rules of chess." "A player who wishes to make a claim of any sort or see a director for any legitimate reason may stop both sides of the clock before claiming &/or finding a director. This book refers to such action as stopping the clock or stopping both clocks. If the opponent's clock is accidentally started when a player tries to stop both clocks, the director will determine whether the claim is still in order. See also 13C6, Claimant's Clock; 16Q, Interruption of Game; 21F, Player Requests For Rulings; & 21F1, Timing of Requests. TD Tip: Players should be made aware of the fact that they should generally stop the clock on their time, not their opponent's." TD Tip: "Without a neutral witness, Rule 10 depends on the reliability of both the claimant & the opponent. If they disagree, then the TD should strongly consider denying the claim. In most cases, by denying the claim, the TD shuts the door to all false claims. Upholding a false claim usually does more harm than denying a legitimate claim. ", -so TD's generally deny sketchy claims particularly without witnesses. 10D: Piece Touched Cannot Move. "If no piece touched has a legal move & no opponent's piece touched can be legally captured, the player is free to make any legal move." 10H: Piece Touched Off The Board. "There is no penalty for touching a piece that is off the board. A player who advances a pawn to the last rank & then touches a piece that is off the board is not obliged to promote the pawn to the piece touched until that piece has been released on the promotion square. See also 8F6, Pawn Promotion & 9D, Pawn Promotion." "For a description & further information of castling, see 8A2, 8A3, 8A4, 8C1, & 9C." 10I1: King Touched First, or King & Rook Simultaneously. "If a player intending to castle touches the king first, or king & rook at the same time, & then realizes that castling is illegal, the player may choose either to move the king or to castle on the other side if legal. If the king has no legal move, the player may choose any move." "If a player intending to castle touches the rook first, there is no penalty except if castling is illegal, the player must move the rook if legal." 10J: When to Claim Touch-Move. "To claim the opponent has violated 10B, Touch-Move Rule, or 10C, Touching Pieces of Both Colors, a player must do so before deliberately touching a piece." "Except for a draw claim, which is an implicit draw offer (14), a player should make a proposal of a draw only after determining a move (9G) & before pressing the clock. The opponent may accept the proposal or may reject it either orally or by deliberately touching a piece (10B). In the interim, the player who made the offer cannot withdraw it. See also 9G3, Draw Offers." "The game is drawn upon a correct claim by the player on the move when the same position is about to occur for at least the third time or has just appeared for at least the third time, the same player being on move each time. In both cases, the position is considered the same if pieces of the same kind & color occupy the same squares & if the possible moves of all the pieces are the same, including the right to castle (8A2 8A3 8A4) or to capture a pawn en passant (8F5). see also 14C8, Sudden Death time pressure; 14C9, Claimant's Scoresheet; & 15H, Reporting of Results." TD Tip: Remember a triple occurrence draw claim is a draw offer (Rule 14, The Drawn Game)." "The game is drawn when the player on the move claims a draw & demonstrates that the last 50 consecutive moves have been made without any capture or pawn move. If the director wishes to allow more than 50 moves for certain positions, details must be posted at the tournament before the first round. See also 15H, Reporting of Results." "If the claim is found to be correct, the game is drawn. If it is found to be incorrect, two minutes shall be added to the opponent's remaining time." "If a valid claim exists,the game is drawn regardless of the position. Even if the opponent can show an immediate checkmate, the game is drawn." 15A: Manner of keeping score. "In the course of play, each player is required to record the game (both player's & the opponent's moves), move after move, as clearly & legibly as possible, on the scoresheet prescribed for the competition. Algebraic notation is standard, but descriptive or computer notation is permitted. The player must first make the move, & then record it on the scoresheet. The scoresheet shall be visible to the arbiter (tournament directors) & the opponent throughout the game." "The player using a paper scoresheet may first make the move & write it down on the scoresheet, or vice versa. This variation does not need to be advertised in advance." TD Tip: "TD's may penalize a player that is in violation of 20C, 'Use of notes prohibited' if the palyer is first writing down the move & repeatedly altering that move on their scoresheet before completing a move on the board." 15B: Scorekeeping in time pressure, non-sudden death time control. "If either player has fewer than five minutes remaining in a non-sudden death time control & does not have additional time (increment) of 30 sseconds or more added with each move, both players are excused from the obligation to keep score until the end of the time control period. Doing so, however, may make it impossible to claim a draw by triple occurance of position (14C) or the 50-move rule (14F) or a win on time forfeit (13C). Score keeping by both players must resume with the start of the next time control period, & missing moves shoould be filled in (15F)." 15C: Scorekeeping in time pressure, sudden death time control. "If either player has fewer than five minutes remaining in a sudden death time control & does not have additional time (increment) of 30 sseconds or more added with each move, both players are excused from the obligation to keep score until the end of the time control period. A scoresheet is not required to win on time in a sudden death time control(13C)." 15D: Use of opponent's scoresheet for assistance. "A player who has an incomplete scoresheet (13C7) & wishes to consult the opponent's scoresheet for assistance may ask to borrow it from the opponent under the following conditions:"
"Both players have at least five minutes remaining in the current time control." "The clock of the player making such a request is running & shall continue to run until the scoresheet is returned." "The opponent is urged to comply with such a request, but this is not mandatory. If the opponent denies the request, the player may stop both clocks & see a director. A director who agrees that the request is appropriate shall instruct the opponent to lend the player the scoresheet. The opponent may not refuse as all scoresheets belong to the organizers. See also 15G, Ownership of scoresheets." "Repeated requests of this type may be deemed by the director to be inappropriate, & the offender may be penalized under 20G, Annoying behavior." "A player who is able to read the opponent's scoresheet without borrowing it is free to use the information gained for assistance in keeping score." 15F: Reconstruction after time control. "At the end of a time control, if the next control is not sudden death, each player must make all efforts to fill in any missing moves on that player's scoresheet." 15F1: Reconstruction of scoresheet by one player. "After the completion of a time control, a player who alone has to complete the scoresheet must do so before making another move & with that player's clock running if the opponent has made a move. An additional set & board may be used." 15F2: Reconstruction of scoresheets by both players. "After the completion of a time control, if both players need to complete their scoresheets, the clocks should be stopped until they are completed. Additionl chess sets & boards may be used. This does not apply if the director rules that it is unnecessary. See also 15F4, Reconstruction when the next time control is sudden death." 15F3: Reconstruction impossible or unnecessary. "If it is impossible or unnecessary to reconstruct the moves as prescribed above, the game shall continue. The players should make a clear diagram of the position reached & the next move played will be considered the first one of the following time control unless the players agree that a later move number has been reached." 15F4: Reconstruction when the next time control is sudden death. "Upon making the time control, if the next control is sudden death, it is less important to fill in the missing moves. The director has the option of waiving the requirement of reconstructing." "The scoresheets of all games in a tournament are the property of the sponsoring organization(s). If the organizer requires that a copy of each game be submitted by the players, duplicate scoresheets must be provided, & players who fail to submit scoresheets may be penalized." "During play, players are forbidden to make use of handwritten, printed, or otherwise recorded matter. While the penalty is at the discretion of the director, a forfeit loss is usually ruled if the material is relevant to the game, while a lesser penalty or warninbg is common otherwise. For example, a player on move five of the King's Indian Defense would usually be forfeited for reading a book on the King's Indian but given a warning or time penalty for reading one on rook endings. See also 1c2, Director Discretion & 21K, Use of Director's Power." "It is highly improper for any spectator to discuss a player's position or time management with that player, to point out that it is the player's move, or to talk in a loud enough voice to be heard by a player with a game in progress." "To minimize claims of illegal assistance, if a relative, close friend, or coach of a player is permitted to stand near that player during play, that spectator should stand behind that player rather than in front, so the spectator is not visible to the player." "A player with a valid claim or complaint of any type should immediately stop both clocks (See 5I) & see a director. In most cases, the player who defers such a claim waives the right to make the claim. However, a delayed claim may still be in order if it is based on evidence not previously available, such as the testimony of a witness, or if the situation causing the claim remains in existence. See also 13C6, Claimant's Clock, & 16Q, Interruption of Game." "Prizes advertised as guaranteed must be paid promptly & in full." "All players have a right to expect:"
That the pairing system used will be fair & administered fairly. That starting times of rounds will be posted & rounds will start reasonably on time. That conditions such as lighting, space, noise, etc. be acceptable & conducive to good competition. That round results will be posted in a timely fashion. That upon request, the Tournament Director will initiate the appeals process. To be present at the starting time for each round if possible. To refrain from analysis of games in the tournament room or audible talking while others are playing. To notify the director well in advance of plans to withdraw from the tournament or miss a round. To read pertinent information posted for the players, usually near wall charts, including the lists of times that the rounds are scheduled to start. To obey the laws of chess. 2. The standards, procedures, & sanctions set forth in this code of ethics are not equivalent to criminal laws & procedures. Rather, they concern the rights & priviledges of USCF membership, including, but not limited to, priviledge of participating in tournaments, events, or other activities as a member of the USCF. 5. "The actions & behavior of individuals participating in USCF activities, or in events sponsored or sanctioned by the USCF, shall be lawful & in accordance with all USCF rules & regulations, & consistent with the principles of fair play, good sportsmanship, honesty, & respect for the rights of others. The following is a list of examples of actions & behavior that are considered unethical. The list is not intended to be exhaustive, & any action or behavior that is unlawful or violates USCF rules & regulations, or is inconsistent with the principles of fair play, good sportsmanship, honesty, & respect for the rights of others, may be considered to fall within the scope of this code of ethics." Intentional violations of tournament regulations, or of any other regulations pertaining to USCF activities & goals, particularly after being warned. Cheating in a game by illegally giving, receiving, offering, or soliciting advice; or by consulting written sources; or by tampering with clocks; or in any other manner. Deliberately losing a game for payment, or to lower one's rating, or for any other reason; or attempting to induce another player to do so. Deliberately failing to play one's best game, in any manner inconsistent with the principles of good sportsmanship, honesty, or fair play. Deliberately misrepresenting one's playing ability in order to compete in a tournament or division of a tournament intended for players of lesser ability; players with foreign ratings are expected to disclose those ratings. Participating in a tournament under a false name or submitting a falsified rating report. Participating in a tournament while undeer suspension. Purposely giving false information in order to circumvent or violate any rule or regulation or goal recognized by the USCF. Attempting to interfere with the rights of any USCF member, such as by barring someone from entering a USCF-sanctioned event for personal reasons. Generally, no individual should be barred from a USCF-sanctioned event for which he or she meets the advertised qualifications, without appropriate due process, & for behavior inconsistent with the principles of this code &/or the rules of chess. If a ban on future participation is imposed, the individual should be notified of the ban prior to his attempting to appear at future events. Violating federal, state, or local laws while participating in activities that are associated with the USCF. In many cases, the USCF Rules for Blitz play differ significantly from the USCF rules for regular or quick play. Some of the more interesting variances are summarized here. Once again, it is not my intent to make this an exhaustive catalog of every difference in these rule sets. Those interested may refer to USCF's Official Rules Of Chess (6th edition, 2014). For questions during or relating to a blitz tournament event, see the tournament director for that event. "Time controls, including the use of delay or increment, are to be stated in advance publicity and must also be announced or posted at the site." "The player with the black pieces chooses the standard timer." "Before play begins, both players should inspect the position of the pieces & the setting of the clock, since once each side has completed a move the position on the board & the time on the clock remains as set." "If the king & queen are set up incorrectly, it is legal to castle short on the queenside & long on the kingside." "If an illegal position is created or an illegal move made without the opponent making a claim, the position stands & a claim not allowed when the opponent has determined a next move." "Each player must press the clock with the same hand that moves the pieces, using one hand to both move the pieces & to press the clock." TD Tip: This rule, the use of one hand in all Blitz moves, also applies to castling & captures. "The tournament director may state at the start of the event the direction the clocks are to face, and the player with the black pieces then chooses the side of the table on which to sit." Blitz 6A: To straighten it. Blitz 6B: If a player knocks over the clock, a penalty may be assessed. Blitz 6C: If your opponent's clock does not tick [This wording obviously needs updating. ], you may press his side down & re-press your side; however, if this procedure is unsatisfactory, please call the director. Blitz 6D: Each player must always be allowed to press the clock after his move is made. Blitz 6E: A player should not keep a hand on or hover over the clock." Blitz 7A: Who has legally mated his opponent's king. Blitz 7B: Whose opponent resigns. Blitz 7C: Whose opponent's flag falls first, at any time before the game is otherwise ended by stopping the clock prior to the player's own clock's flag fall, & who has mating material. Mating material consists of (at a minimum) two minor pieces, a pawn, a rook or a queen provided it isn't a position where one could claim it to be a draw under section 8. Blitz 7D: Who, after an illegal move is completed by the opponent, takes the king (if the king is in check) or claims the win & stops the clock, before the player determines a move & provided the player has sufficient mating material as defined in rule 7C. Blitz 7E: An illegal move doesn't negate a player's right to claim on time, provided it is made prior to the opponent's claim of an illegal move. If the claims are simultaneous, the plyer who made the illegal move loses." Blitz 8A: If one of the kings is stalemated. Blitz 8B: By agreement between the players. Blitz 8C: If the flag of one player falls after the flag of the other player has already fallen & a win has not been claimed, unless either side mates before noticing that both flags are down. Blitz 8D: If one player has insufficient mating material when the opponent's flag falls or makes an illegal move. 'Insufficient Losing Chances' (ILC) claims are not allowed." 1. If both players have just one identical piece & if neither side can show a forced win. 2. In K+B vs. K+B of opposite colors, with only one pawn on the board, provided there is no forced win. 3. K+rook pawn vs. K can be claimed as a draw once the defender is on the rook file in front of the pawn. K+P vs. K can be claimed as a draw once the defender is immediately on the square directly in front of the pawn as long as it's not the 7th rank. 4. K+R+rook pawn vs. K+R is a draw if the pawn is blockaded by the king & there is no immediate win. 5. The claimant has a significant material & positional advantage. Copyright: © PG Designs, 2015, 2016, 2017, 2018, 2019 all rights reserved.